John Calaby was born at Creswick. He obtained a Diploma in Applied Chemistry at the Ballarat School of Mines (SMB) in 1942. Calaby worked for the CSIRO Wildlife Survey Section. From 1972 to 1973 he played a significant part in the Alligator Rivers Region environmental Study. Described in a CSIRO media Release in 1998 as one of Australia's greatest biologists, John Calaby's long and illustrious career in wildlife biology resulted in a number of animals named after him, including a pebble mouse, several parasitic mites, a fleas and a masked owl. 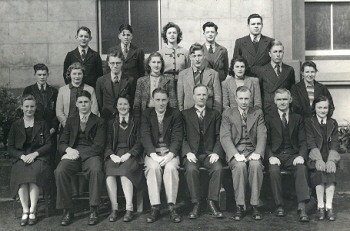 Back Row L-R: R. Spence, I. Grant, I Boustead, K. Palmer, E. Marshman. Centre Row L-R: A. Stevens, M. Dark, J. Elliott, J. Martin, G. Myers, M. Pierce, J. Gibbs, W. Hender. Front Row L-R: P. Wells, G. Mounter, P. Martin, JOHN CALABY (editor), Dr Pound, Mr Mein, Mr Proctor, L. Siemering.